Wannamaker Seeds is a specialty crops seed business in rural Henderson County, North Carolina. Our mission is to help you succeed in growing edamame soybeans by supplying you with a consistent source of high quality seed. Whether you are a home gardener, a farm, or a large vegetable processor in the United States or in distant countries, we are happy to be of service. All of our edamame varieties are Non-GMO. Additionally we offer several wildflower seed mixes and can design a custom mix specifically for you. Take a few minutes to look around our website or go straight to our order page. Most of all, have a wonderful growing season! 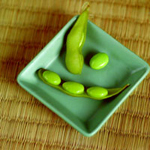 We solely offer varieties (seed size 1000-1250 seed/lb) for the premium edamame market--that is, markets that demand edamame pods of large size, deep green color, and exceptional taste. Clear hilum (eye) soybeans (seed size 1600-2000 seed/lb) that are used to make tofu are not suitable for this market. US consumers deserve the best! Midori Giant and Chiba Green solidly fit in this premium market. Give them a try! If you desire 5 lbs or more, SHOP HERE for competitive pricing. Otherwise, you may find our seed in smaller quantities from many US mail order companies. Email or call us if you need a suggestion of one to call.